The 61-note keyboard became the de facto standard for electric keyboards through its use on the first widely available electric keyboard instrument, the HAMMOND ORGAN, but the demands on today’s players require a greater scope. A keyboardist today may jump from B-3 to Electric Piano to Clav in the same song, and if based in the Piano tradition, may find a 61 note keyboard limiting. The Sk1-73′s 73 note Fatar keyboard provides the proper “breathing room” for a modern keyboardist, while retaining the superior feel, light weight and small footprint of the 61-note model. It is also the perfect ax for singer-songwriters and accompanists of all genres, due to its ability in shifting the keyboard response automatically between piano and organ-type “feels”. The 15 Pound Sk1 is the smallest and lightest Genuine Hammond Organ ever made, and it’s even more astounding when you consider the palette of Hi-Def Extravoices that are onboard. For the gigging musician, there is really no other choice but this comprehensive keyboard. How many times have you finished a satisfying show and faced moving your equipment with dread in your eyes; as your guitarist puts his ax in the case, picks up his amp and he’s out the door? Now you can pack up and hit the road in a jiffy, too, with NO compromise in available sounds. If you’ve been “making do” with an imitation Hammond, or the “Jazz Organ” preset on your synth, because you had no room for a B-3 and Leslie, you can now bring the soul back to your show, even if the venue has a postage stamp for a stage. A KEYBOARD MAGAZINE “Key Buy”! The most versatile organ/keyboard anywhere. For all practical purposes, the XK-3c is the “Upper Manual” of a B-3. All the familiar ingredients are there. Reverse Presets, Chorus-Vibrato on the left, Percussion on the right. A 2-tube preamp, and full MIDI controller capability are just a few of the features of this beast. The nameplate says “XK-3c” but play it, and you’ll think “B-3”. The HAMMOND B-3 was revolutionary upon its release in 1955, and became one of the most important instruments in history. Now HAMMOND repeats the revolution for the 21st century in the form of the Stage Keyboard (or Sk) series of keyboards, which combines the “must-have” keyboard voices needed for any gig, any session, in any genre, with a full-featured genuine HAMMOND Organ plus Digital Leslie, and provides it in trim packages that range from the ultralight 15 pound Sk1 to the 35 pound Sk2. Pianos, Electric Pianos, Clavs, Transistor Organs, Accordions, Synths, Orchestral and even 32 ranks of Classical/Church Pipe Organ team up with an authentic Hammond to make the most comprehensive set of essential keyboard voices ever offered by Hammond, or any other manufacturer. Sounds alone do not insure greatness, The Sk’s have Hammond’s finest waterfall keyboard yet, calibrated especially for the “B-3″ touch, yet providing maximum comfort for those more familiar with “Piano Touch”-the Sk wants to be played. Why tote multiple boards in your rig? Get rid of your Minivan and give your roadies a break. Every keyboardist wants a real Hammond. Now you can have one with NO compromise. For the occasional organist, or those keyboard players who want the genuine HAMMOND sound, without needing to carry around another keyboard, the XM-2 is for YOU. The XM-2 is essentially our award-winning XK-1 (minus keyboards) shoe-horned into a one-space rackmount MIDI module. Play with any MIDI controller or sequencer. 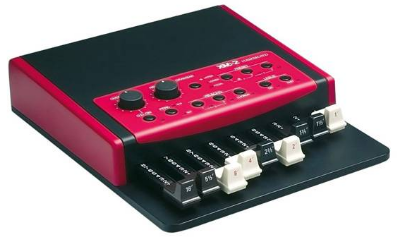 Also perfect to add the distinctive HAMMOND sound to a non-drawbar home or Church organ.